In spite of being just 2mm in length, a super long neck and even longer jaws make this arthopod very creepy. This spider species was discovered in Madagascar in 2006 – while it is one of a family of known Assassin Spiders (those that kill and eat other spiders), it is the only one with dare we say…comically distorted proportions. 1. 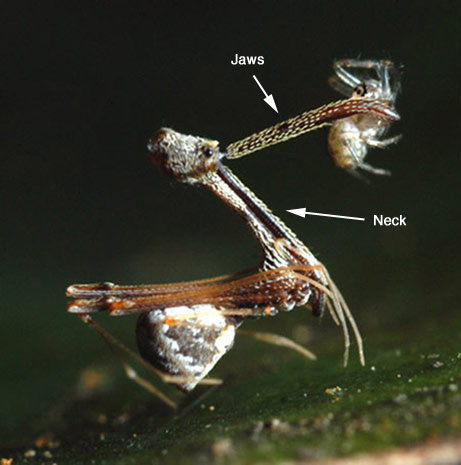 The Assassin Spider uses its elongated jaws to capture prey. 2. Venom in the fangs at the end of the jaw effectively kill the prey. 3. Dinner is served. No webs needed. This is honestly the strangest looking spider I’ve ever seen…And I must say that DAMN IS THAT COOL OR WHAT!? HOLY HELL THATS SO HILARIOUS!!! LMAO This is one other spider i can deal with! although i cant stand the way spiders are or look i guess i could accept this too. Where the hell is it’s legs? I keep looking at it and trying to find where each body part is, but I can’t see what “it” would use for legs. It’s like a Bizaro Spider. Spiders aren’t insects, they’re arachnids. dont mess with bob, he knows EVERYTHING. holy sweet troll jegus wtf is that?!?! right here on this post. I will be coming bahk to your web site for more soon. un cargador y un cable USB. You are so awesome! I do nott suppose I have read through anytfhing like this before. So niice to find someone with some genuuine thoughts on this topic.